Enlistment of African Americans into the Union Army began in earnest in January 1863. Hundreds of Charles City slaves had left the county with Gen, McClellan’s Army when it retreated from Harrison’s landing in August 1862, and many of those men enlisted in the U.S. Colored Troop units organized in Hampton and Norfolk. Other men were recruited here in the county when Union forces landed in May 1864 and embarked on building Fort Pocahontas. Those men found themselves engaged almost immediately in the Action at Wilson’s Wharf on the 24th of May facing Confederate cavalry that poignantly included cavalrymen from Charles City County on the opposite side of the fortifications. A majority of those who enlisted had been enslaved, but this roll includes at least a dozen who were free persons of color. 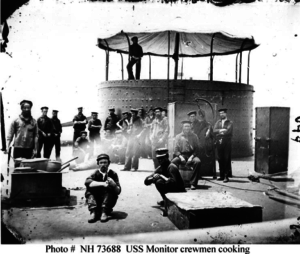 Slaves also enlisted in the Union Navy by making their way out to Union vessels when they ventured up the James River. A group of 18 or more, mostly Shirley Plantation slaves, boarded gunboats on the night of July 18, 1863 and enlisted on board ship. 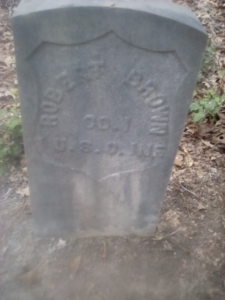 Robert Walker Brown, a free person of color, was enlisted in the 1st U.S. Colored Infantry at Fort Pocahontas just prior to the battle. The number of Charles City men who died in the service of the Union as a percentage of the total serving is considerably smaller than the number of Charles City men who died in the service of the Confederacy. The difference probably is accounted for by their later entry into the war and their less frequently deployment as fighting forces. This roll of 119 men is undoubtedly incomplete because the place of birth for many recruits was simply listed as Virginia and because some recruits wary of re-enslavement falsely gave their place of birth as Canada.